Ralph Hamor, incoming American College of Veterinary Ophthalmologists president, congratulates Elizabeth Giuliano on her service to the organization. University of Missouri Professor of Veterinary Ophthalmology Elizabeth Giuliano, DVM, MS, DACVO, was recently honored for her six years of service to the American College of Veterinary Ophthalmologists (ACVO) Board of Regents. She has served the organization as president for the past year. 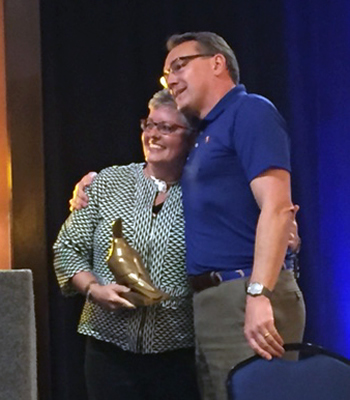 During the ACVO’s 47th annual conference held Oct. 26-29, in Monterey, California, incoming ACVO President and MU CVM alumnus Ralph Hamor, DVM ’87, MS, DACVO, presented Giuliano with a bronze Horus statue in recognition of her service. Horus is the falcon god of ancient Egypt whose role was to conquer darkness. 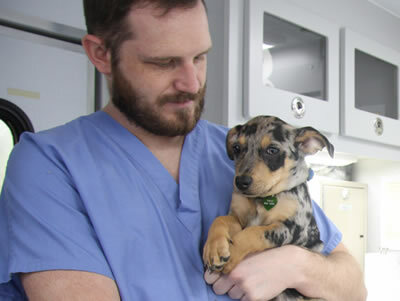 Giuliano earned her DVM at the University of Wisconsin-Madison and completed a master’s degree and her ophthalmology specialty training at MU. She joined the MU faculty in 2002.